One from the archive today, that I came across as I was sorting through images for use in up-coming Camera Club talks. This is Arlington House, an eighteen-storey residential tower block built in the early 1960s in Margate, Kent. It’s an example of the architectural style known as Brutalism. It’s a style that some regard as ugly and this tower has attracted quite a lot of negative comment over the years. There was an era in the last ’50s and early ’60s when a lot of towns erected tower blocks like this for residential occupation. In most instances they stood out like sore thumbs and looking back now from more enlightened times, one wonders what on earth convinced Town Planners that they were a sensible, or appropriate, addition to the sky line. Arlington House is certainly an intrusive feature – the tallest building for miles around. It’s only saving grace is the undulating facade. 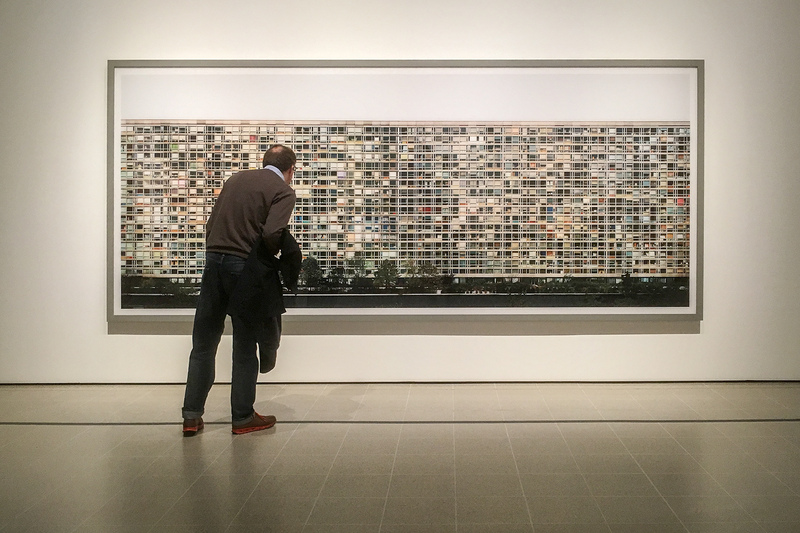 Last week I saw an inspirational major exhibition by the German Photographer Andreas Gursky (at the Hayward Gallery until 22 April ). Gursky’s work is heroic and monumental in scale, particularly his architectural work. A typical example is Paris, Montparnasse 1993 (see below) – a work that involved merging multiple images in post-processing to create a single image. When I viewed this work it reminded me of the Margate tower block – simply because of the repetitive nature of the content, and for no other reason. Seeing the work of other artists is important. Every exhibition provokes thought, suggests ideas, and facilitates our growth as photographers. This entry was posted in Architecture & Buildings and tagged Andreas Gursky, Architecture, Arlington House, Brutalism, Margate, Photography, Tower blocks. Bookmark the permalink. I love this image. I would be tempted to flatten the perspective and then duplicate it many times to make it appear huge. Thanks Robin. I searched the giant Paris Montparnasse image and couldn’t spot the repetition or any evidence of ‘joins’. Very skillful processing by Gursky. If tried something similar, I’m quite sure the repetition would be rather obvious – although it might be fun trying. A task for next winter perhaps! 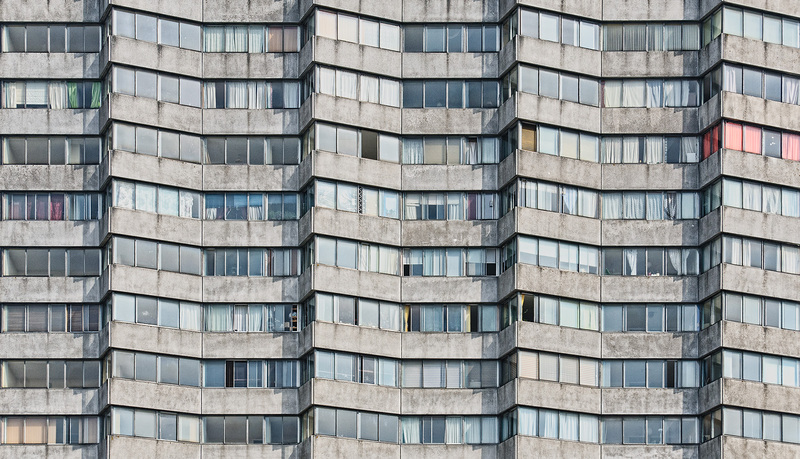 Your photo of the Arlington House (I had to look it up) matches Gursky work very well, Andy. Interesting history! I have heard so much about this exhibition at the Hayward Gallery, I’d love to visit it myself. I saw a Gursky Exhibition in Germany and was impressed. You are so right about seeing the work of others. Yep – we can’t live in a cultural vacuum. I think some do, Andy! Yea, looking about and at what other do gives inspiration …but to copy is a no, no for me. Thanks Paula. You are right – we can never copy or imitate someone else successfully, but they can prompt ideas that we may in some way or another incorporate into own own creative thinking. Marvelous image, Andy! You’ve found the perfect way to showcase the art itself, but to also draw us in further through the man’s curiosity — and through your own as well. Thank you Heide. This was one of the best exhibitions I’ve seen in a while – thought provoking and inspiring. All true, Andy, and when you can’t get to an exhibit, which is undoubtedly a very nourishing thing to do, the media is always there. The Friday NY Times Arts section is often good for that (not every week, but often), and today, on our national public radio, I heard an interesting piece about a photographer in Delhi, Dayanita Singh. All grist for the mill. Thanks Lynn,and in particular thank you for that link. A unique idea from Dayanita Singh on how she presents her work which I enjoyed reading about. Stories like that stimulate thought.